She runs a design agency called Grumpy Turtle Design and is passionate about designing for change, specifically in our habits that impact the ocean. She started running an event every week in Manly Cove where you can go and snorkel and help clean up Manly Cove. It’s called Operation Straw, and the hope is that by the conclusion of the project the amount of data collected (where the straw originated from, how many were found) will be enough to help spark change on both a national, and global scale. What made you start Grumpy Turtle? I’m a dive instructor, so I’ve spent a lot of time underwater with sea turtles. One thing I love about them is their faces – they always look like they’re frowning, and well, grumpy. As I began to combine diving with design and communications, I kept thinking about turtles and the fact they probably look so grumpy because of our actions – our use of plastic, our inability to act on climate change on a broad scale and everything else we’re doing to impact the marine world. 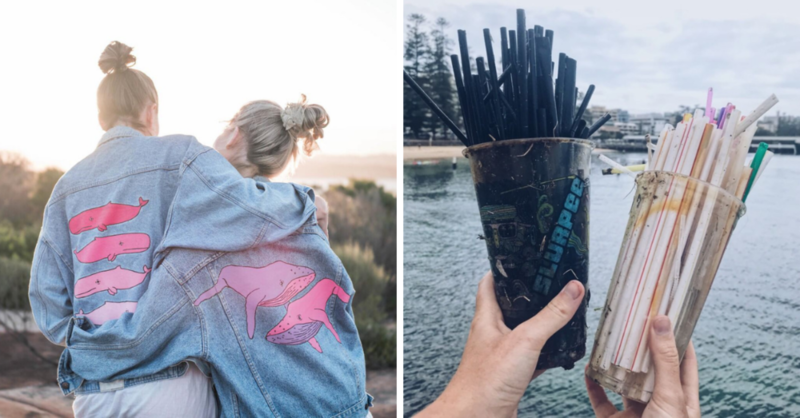 Everything I do, be it graphic design, a blog or a denim jacket, has the goal of making these sea turtles a little less grumpy by influencing those around me and supporting businesses, organisations and individuals who are doing the same. How did you first come across sustainable living? I taught diving on the Great Barrier Reef for three years, then lived in Tonga diving for half a year after that. This was where I really fell in love with the ocean, but I wasn’t really aware of what we were doing to it. My parents raised me as a vegetarian, so I’ve always been aware of the impact we have on the animals of this planet, but in regards to issues like climate change, plastic pollution etc. I was quite oblivious up until four or so years ago! When I returned from Tonga I started dive instructing at the local aquarium and this was where I learned more about plastic and decided to start doing something about it by running beach cleans. It was kind of a snowball effect, I learned one thing and this led to another and another. What has been the most challenging part since you began embracing this type of lifestyle? Dealing with feeling overwhelmed and frustrated. Sometimes it feels like you’re just one person making these small actions but you have to remember that it’s these small actions combined and embraced by other individuals that will have the most impact. We can’t wait for the government to act (especially in today’s political climate!) so it’s up to us to make the changes we want to see. I’m also lucky to have a lot of people in my network who care about the same things I do, and that keeps me sane! You create the most incredible designs on denim jackets, what made you start this? Thank you! I create this one for my good friend’s birthday as a way of giving her something special that didn’t involve buying more stuff. I had lots of people asking if I could make them one after I uploaded a snap of it and it has gone from there – very unexpected but very exciting, and I’m looking forward to making a lot more this year. My house is currently filled with way too many second-hand denim jackets! Your Instagram is a consistent source of inspiration and your dives make me both sad, and proud simultaneously. What is the craziest thing you’ve uncovered during your dives? That’s really kind of you to say. I’m currently running a project called Operation Straw, where we snorkel a local dive site every weekend and count how many plastic straws we find ( it’s been running just over a month and we’ve removed more than 700 straws from the ocean) to encourage local businesses to reduce or eliminate straws from their practices. On one of the first dives, we came across an octopus that had four straws in its tentacles. I always find sights like that so confronting, when we see nature interacting with items they should never have to interact with. It’s a powerful reminder of why it’s so important we change our own behaviour. Who or what inspires you to do what you do on a daily basis? A combination of my love for the ocean and the planet, and the knowledge of the devastating impacts we have on it. One of the most kickass ladies I know who runs the SEALIFE Trust Aust./NZ, Claudette Rechtorik said; “once you know about these problems, you can’t unknow them”. With that in mind, how can you not do everything you can to help? I also feel most inspired after I’ve been snorkelling or diving. A connection to nature is so important and we really need to make sure future generations who are getting more and more glued to technology continue to get outside and explore this big beautiful blue planet. Underpromise and overdeliver! I’ve learned the truth and beauty in that by doing the exact opposite. Dream morning routine: wake up, do a yoga class, go for a swim, make a delicious breakfast and get ready for the day feeling stoked I’ve already had an amazing morning. Actual routine: Hit snooze a couple of time, scroll through social media then hop out of bed and make some breakfast. Not very inspirational, but honest! When I make the dream morning routine happen though, I feel the difference. Allowing yourself time to do something for you first thing, like exercise, a dip in the ocean or even just reading for half an hour sets you up for the day ahead. I now turn my phone to flight mode when in the bedroom, starting and ending the day by scrolling through a screen is not so great for our mental state. So this year I am all for making that dream morning happen! Freedom to live the life the kind of life you want to live and to be proud of what you do every day. To me that’s success. I find reading a great way to switch off – I’m a huge bookworm! I’m breaking the rules a bit here by giving you two books, one ocean themed and one on sustainable living. The Art of Frugal Hedonism: A Guide to Spending Less While Enjoying Everything More by Annie Raser Rowland and Adam Grubb is a super easy, funny and informative book about living life to the fullest on a budget in a way that’s kind to the planet. I read this while sitting in the back of a troopy on the way to Cape York to do a ten day clean up with Tangaroa Blue and Clean Coast Collective, and even though we were off-road on an insanely bumpy dirt track I still read the whole thing because it’s so great! On a more aquatic theme, the book Voice in the Ocean by Susan Casey is a wonderfully insightful peek into the incredible life of dolphins and details the crazy research history of this species. It’s a reminder of how phenomenally amazing our oceans and the life that calls it home are. For those reading this who are inspired to make a change today in their own world, what do you recommend they begin with? Where should they start? Think globally, but act locally. Wildlife conservation starts in our own homes, with our own actions. After my partner and I went to see the movie Blue, he said he wanted to quit his job as an electrician and do more to help our oceans. But this isn’t what conservation is about – it’s about doing what we can and looking at our own lives and seeing what positive changes we can make. Imagine our planet if we all did that! Start small by changing your own habits or volunteer with a local organisation and then go from there. What is one thing people can do today to help protect the environment for future tomorrow’s? Take a look at your diet! Choose locally grown, in-season fresh produce, avoid plastic packaging and help our climate by reducing or completely eliminating meat from your diet. There are so many wonderful people out there doing great work! I love the witty and clever artwork of Carla Scotto, photography by Michaela Skovranova and illustrations by Jaimee Paul to name a few fellow creative ladies who care about the planet. Learn more about HARRIEt, here.